Superstitions aside, students correctly know that the bell curve does affect them in some way or other. However, I hope that no one is feeling haunted by the bell curve. What is this ‘bell curve’ all about? In probability theory, the normal distribution is a continuous probability distribution that has a bell-shaped probability density function, known as the Gaussian function, or informally, the bell curve. The normal distribution is the most prominent probability distribution, because many large sets of data are approximately normally distributed. For example, the heights of all students in NUS are likely to be normally distributed. The weights of NUS students probably follow a normal distribution too. Likewise, if I set exams targeted at the average competency of a group of students, and if the class is large enough, the exam scores are likely to follow a normal distribution curve. Setting such an exam is, by no means, easy. Pitch it tough, most students will fail. Set it too easy, and many will score very high grades, and the resulting scores are hardly differentiated. Differentiation is necessary for CAP purposes, and for Honours classification, and these are here to stay for the foreseeable future. Most if not all major universities have variants of degree classes or GPA scores. And because of the need for differentiation, many institutions from North America to Asia, use the bell curve as a mechanism to moderate marks. Module requirements may encompass different modes of assessment such as tutorial presentations, laboratory reports, projects, essays, as well as mid-term and final examinations. Grading may be based on absolute performance, relative performance, or a combination of the two. Higher-level modules with small enrolments typically grade a student based on his absolute performance; larger lower-level modules take into account a student’s performance vis-à-vis the other students in the same module. Where necessary, the final grade which a student receives for a module may be subject to moderation. One important reason for grade moderation is that examiners come from diverse academic backgrounds and may be accustomed to different marking regimes. While we do make every effort to make sure modules are designed with clear learning outcomes, and professors are responsible to ensure their exams are pitched at the right level, grade moderation will prevent grade inflation or deflation, and helps to achieve consistency in assessment grading across modules. At the end of the semester, a student is awarded a grade (and not specific marks) for each course taken. As such, NUS adopts a ‘recommended grade distribution’ in the following manner. I shall illustrate with an example – bear in mind that this is meant for illustrative purposes and is not the actual distribution that we are currently practising. which is approximately 3.34, or roughly B grade. And here are 3 possible course grade profile scenarios after moderation. For the first module, the test/exam may have been too easy, resulting in high cut-off marks for each grade. The average mark was 83 for a class of 630. The department will also look at the paper before moderation. In the next scenario, the resulting cut-off marks for each grade after moderation, are moderate. In this final scenario, the resulting cut-off marks for each grade after moderation are rather low. I must emphasize that the recommended grade distribution is not applied blindly, and there are ample opportunities, within reason, for discretion and flexibility. First, the class size must be large enough, preferably above 30. For smaller classes, Professors are given discretion on an appropriate grade distribution because small sets of data may not be normally distributed. Second, we are not looking for a perfect fit, i.e., we usually ignore small deviations. Third, if Professors have strong reasons to deviate from the recommended grade distribution, we are usually amenable to acceding to their requests. For example, some modules belonging to special programs in the various Faculties/Schools have their own distributions. 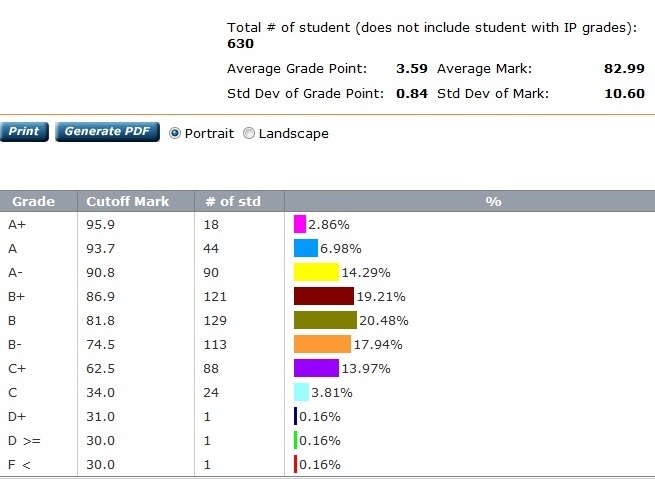 Fourth, we sometimes also look at the CAP profiles of a class, and tweak the grade distributions appropriately. For example, if many students with high CAP choose a particular course, it will not be fair to apply the recommended grade distribution to this class. 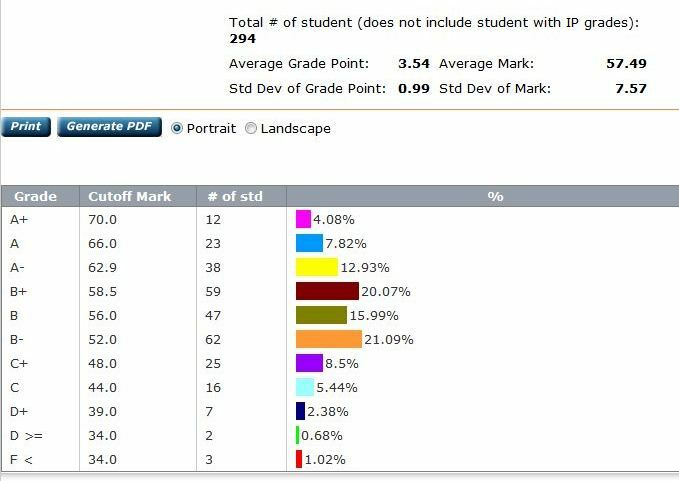 Another example: for Honours classes comprising students with an average CAP of at least 3.5, the grade distribution will be skewed higher. Additionally, much goes on post-exams, before the grades are finalized and released to students. First, the grade profiles for individual modules are examined and compared at the Department level, and then across Departments at the Faculty level. All grades are carefully scrutinized by Department and Faculty Boards of Examiners before they are submitted to the Board of Undergraduate Studies and the Board of Graduate Studies for approval. Further checks are conducted at the University level by the Board of Undergraduate Studies and Board of Graduate Studies to ensure that there is consistency of assessment across Faculties/Schools. In conclusion, I hope that this post has given a better picture of how the bell curve works at the NUS, and hopefully this helps to alleviate some bell curve anxiety. The bell curve is used primarily as a tool to moderate grades, and as a guide to prevent grade inflation or deflation. We do not apply the bell curve mindlessly or excessively. Students are sometimes worried about falling on a ‘wrong side’ of the bell curve. Do not worry too much, more often than not, we err on helping students along. Here’s also wishing everyone a joyous Lunar New Year!